So Han Solo, ROLO, Raid Han should always go first. But this time, the whole empire team got to play first. 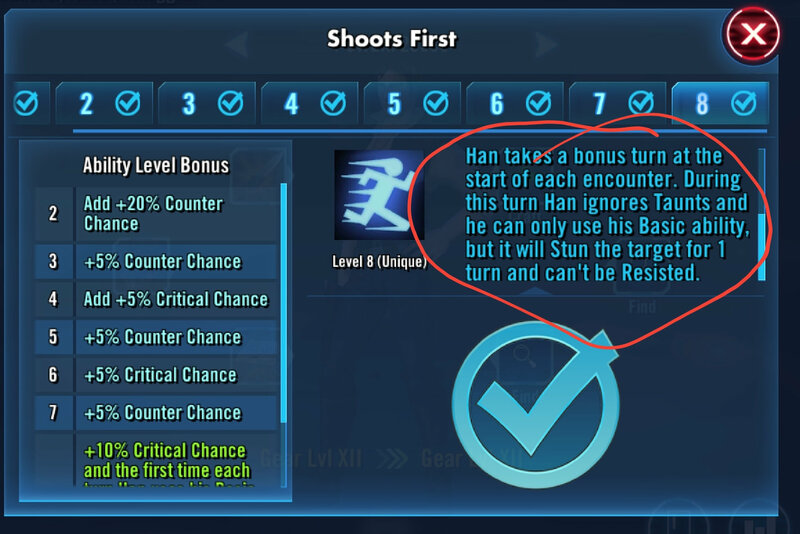 When rebels got to play, Han goes first, his basic attack is the only one available (like it should be). And Vador keeps spaming his AOE, generally 3-4 times before culling blade. The description for his skill does not have him moving first, just getting a bonus turn at the start of the round. As with many events they use TM and will allow the other side to take turns first to help increase the difficulty. Descriptions are not game mechanics. In this case they were just trying to be clever re: Han v Greedo in the movie. The last tier tarkin lead killed me but I used old Ben for ability block and it helped finally after 3 to 4 trys. In Rebel Roundup using Troopers you'll enter the Han/Chewie phase with most of your team at 100% TM and can easily kill Han while he sits there at 100% TM too. For the Daring Droid they're programmed to go twice before you go once, regardless of your team's abilities. Just like how you can't stun R2 in the previous two tiers. Different mechanics for special events. This is nothing new. Here is the description on the ability on which you are referencing, the one that has him taking a bonus turn but not shooting first. A lot of people agree on a lot of things here that are wrong. If it's at the "start of each encounter," are they not encountering the enemy at the start of the battle!? It doesn't say he "gets an extra turn," it says he "takes an extra turn." SOMEONE screwed up, whether it's the devs or the people who wrote that description, but it's **** to say that it's WAI when that is the ability as it's written and that's what people are putting resources into having. I know this discussion has come up before, but it's still flawed, and SOMETHING should change, whatever side of the operation it has to be on. I mean, what's next, we put a description in on a new toon that says "kills everything in one hit" and then we find out it doesn't REALLY kill everything in one hit, it just has a chance to kill things in one hit, but it's WAI so screw off. EA needs to take responsibility for this instead of shrugging it off, and players that say it's no big deal aren't looking at the bigger picture of what that says to EA - that they can write whatever they want in the description whether or not it's fully accurate. People choose these abilities based on descriptions and spend resources on them. EA needs to step up and fix this and be a lot more careful in the future. If they can write two-page long ability descriptions for some of the newer toons, they can manage to be accurate instead of misleading. "Takes a bonus turn" means that he gains 100% turnmeter, like Kyno stated. The unit is not guaranteed to perform the next action. The difference between "takes a bonus turn" and "gains 100% turnmeter" is most likely, that the turnmeter gain from "takes a bonus turn" cannot be prevented, while the turnmeter gain from "gains 100% turnmeter" can - however, this hasn't been confirmed by Kyno (and as far as I know, nor anyone else). He gets a bonus turn at the start of the round. However, so do all of the enemy toons in these events. Everyone gets a bonus turn, then once the bonus turns are done TM starts accumulating. When there are multiple toons taking bonus turns at the start of a round then there has to be some way of differentiating them. In PvP it's random, in PvE it's generally coded so the enemy go first. That's one way the devs have chosen to make these events more difficult. If they didn't do this then they'd just tweak something else to make it harder, so it's probably best to stop complaining while you're ahead.